We are a family of seafood lovers. We are fond of eating all kinds of seafood- fish, shrimp, crab, and squid. Speaking of fish, our favorites are cream dory, salmon head, and tuna! My husband likes to cook different viands for lunch but when he runs out of recipe, we always resort to canned meals. Made from real, meatier, and premium tuna rich in Omega 3, Protein and DHA. Speaking of DHA, it's a brain vitamin so this is good for the kids too. I love the design of the can. At first, I thought this is an international brand. It also comes in a convenient easy to open can. Each can is heavy on pure tuna with six unique gourmet flavors. What I noticed when I opened a can is the content- packed with more lean tuna meat and has lesser oil content compared to other brands. Gold Seas Tuna Chunks is also responsibly fished, Halal-certified and packed in lithograph cans using a strict canning process to ensure that each can is as safe as it is appetizing. Gold Seas Tuna Chunks variants -- Yellowfin Tuna Chunks in Olive Oil, Olive Oil with Chili, Springwater, Tuna Chunks in Herb and Garlic, Lemon and Pepper and Mild Indian Curry. My faves are the last two flavors because I love lemon, pepper, and curry! 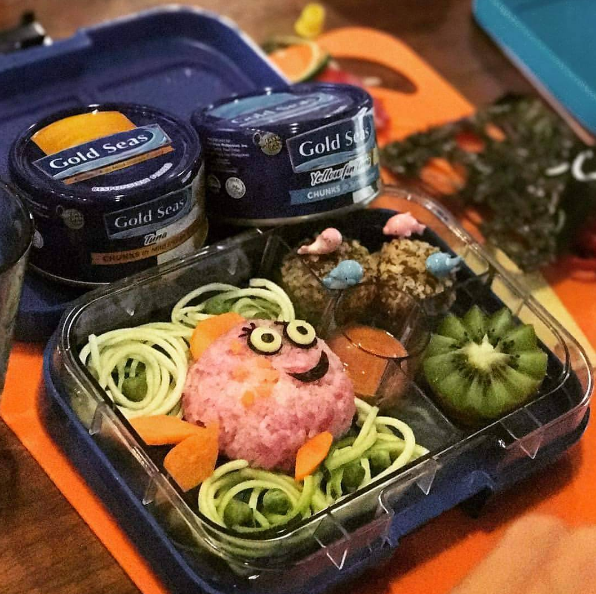 Who here has a kid who loves fish especially tuna? My son eats fish but mostly cream dory and milk fish. He doesn't like fresh or tuna in a can but when he saw Gold Seas Tuna Chunks, he's so giddy to have a taste of one particular flavor- Chunks in Olive Oil. I know it's frustrating for moms to find out that their kid’s school lunch was mostly left uneaten. Not only do spoiled leftovers translate to a waste of food, time and resources, it also deprives growing kids of the nutrition they badly need. Fortunately, there is now a fun, delicious and nutritious way to persuade fussy eaters to clean off their packed lunches and that’s by preparing meals bento box style. 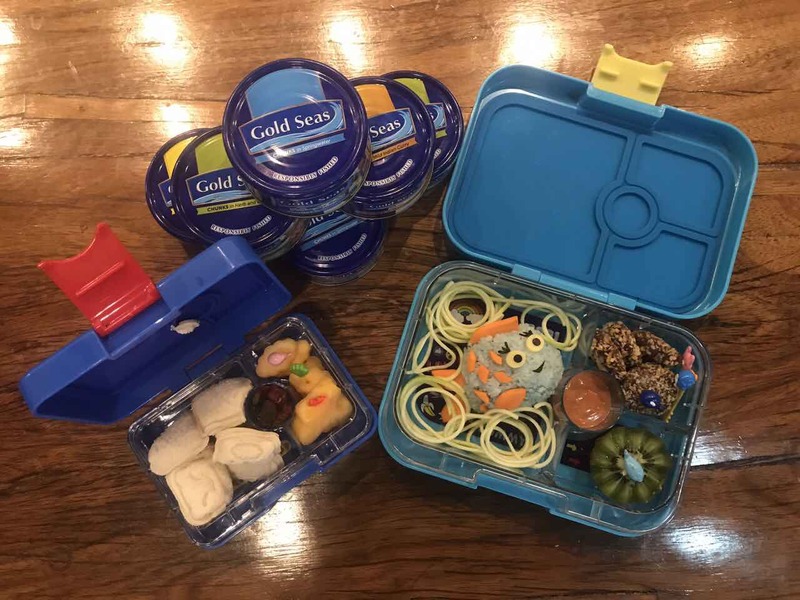 All it takes is bit of creativity, basic cooking tools like cookie cutters, and a hearty and wholesome food base or viand like Gold Seas Tuna Chunks. 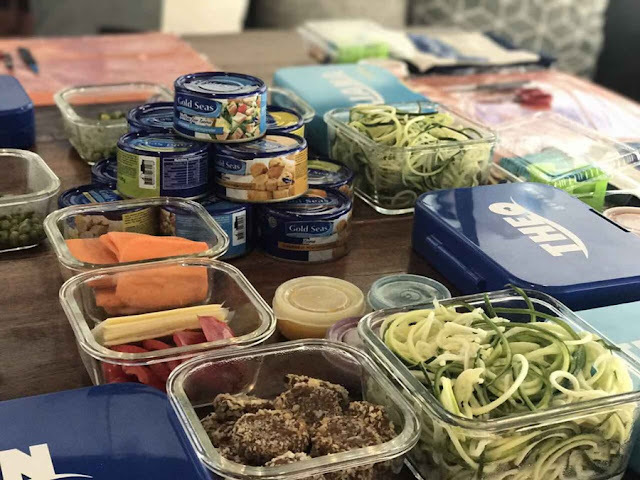 Bento box expert Kat Maderazo, @bentobyKat on Instagram, came up with several easy-to-prepare recipes using Gold Seas Tuna Chunks to help busy work-at-home moms find a way to encourage their little ones to finish their meals whether they’re away at school or at the comfort of their own homes. 1. Drain 1 can of Gold Seas Tuna Chunks in Herb and Garlic. 2. Transfer to a mixing bowl and break the tuna chunks with a fork. 3. Mix 1/2 cup of flour and season with salt. 5. Generously coat nuggets with breadcrumbs. 6. Bake or air fry for 10-15mins until slightly brown. 7. Arrange in bento box with rice, vegetables and fruit. Have you tried Gold Seas Tuna Chunks? What's you favorite flavor?